There were two good reasons that made me look forward to the world premiere of a new play by Sarah Treem. 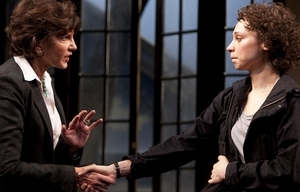 First, I was impressed by the first play, A Feminine Ending when it was presented by Playwrights Horizons in 2007. Embracing an incontrovertible feminist theme, it followed the course of a young woman who, as she follows a career path as a classically trained musician, finds her life irreparably consigned to compromise. As the play cleverly used musical metaphors in its structure, it also made us aware of a new and exciting voice in dramatic literature. ( Curtainup's review of A Feminine Ending). The second and more immediate reason for my enthusiasm were the beautifully composed, emotionally gripping episodes that she contributed to the HBO series In Treatment. It's the where and the who in Treem's invigorating new play The How and the Why, under the direction of Emily Mann that both defines and validates another essentially feminist tract. What happens when two strong-willed women, both evolutionary biologists, collide? The answer is much more entertainingly digressive than you would think or expect. That they are mother and daughter is only a starting point. The where is a senior professor's office in Cambridge, Mass. It is the weekend of a major conference: The National Organization of Research Biologists. The first who (there are only two characters in the play) is 56 year-old Zelda Kahn (Mercedes Ruehl), whose tenure and career is largely the result of her scholarship with regard to advancing a revolutionary theory known as "The Grandmother Hypothesis, " or to put it simply: the assumption that the end of a woman's reproductive years is essential to the survival of her descendents. The other who is 28 year-old Rachel Hardeman (Bess Rous), an obviously brilliant young NYU graduate student whom we can see from the start has more on her mind that defending her own research and conclusions based on an opposing theory "Menstruation as a Defense." Although Rachel has submitted her paper to the conference for review by a board for possible presentation she has also come to Cambridge to meet her birth mother whom she has never seen. It's not a surprise meeting, but it is awkward for them. Zelda is over-anxious, jumpy, and conciliatory. Rachel is defensive, ill-at-ease, and testy to the point of being openly hostile. What stroke of outrageous fortune or providence brings together a mother and a daughter both of whom have unwittingly become exponents of diverging theories in the same scientific field? What personal and professional conflicts are inherent to their meeting in which there are as many questions in regard to their relationship or lack of one as there are with respect to their inevitable debate on the implications of their scientific theories? Treem has set up an unlikely situation but in doing so she has created two extraordinarily interesting women. Each will have the floor and the opportunity to explore the how and whys of their lives as well as of the theories that they take particular delight in expounding. That there is not a dull moment can only be traced to the brisk and brittle dialogue that whizzes by like a tennis ball hit from one end of the court to the other. The bright and lively discharging of accord and discord could have been confined to the simply functional office that Rachel says looks "very masculine," possibly insinuating something. But designer Daniel Ostling has evoked a dumpy bar in Boston for the Act II setting where the main decor is a row of neon-lit beer signs. An effective change, they do not take out attention away from Rachel and Zelda as they both seem intent to both avoid as well as to find resolutions. Although multi award-winner (Lost in Yonkers, The Goat, or Who is Sylvia) Mercedes Ruehl has a way of taking ownership of the stage — whether walking in strides that defy the graces or ingratiatingly indulging in her own crafty idiosyncrasies — Treem's sparkling dialogue gives Ruehl many opportunities to sound like a brainiac version of Eve Arden, the late wise-cracking movie and TV star —and it pays off. After 28 years, there are bound to be questions between a grown daughter and the mother who gave her up for adoption. When Rachel says, "I have a million. . . "Zelda zings back with "The way I see it, your areas of curiosity must be divisible into the historical, the biological, and the psychological." But that doesn't mean there won't be a surprising denouement during which the pragmatic Zelda may succeed in breaking your heart. Rous, whose credits are largely fringe and regional, holds her own as the belligerent and conflicted Rachel. It is a finely developed performance that builds substantively throughout the play. An important plot development has Rachel conflicted about whether she should share the credit for her research with the college boy she loves. Of course, Zelda has no qualms about what Rachel should do. We can credit Mann's carefully balanced and perceptive staging for preventing this two-character play from ever sounding didactic or becoming visually static. It moves swiftly from point to point with never a dull moment. If Treem's play builds exponentially on the theories proposed by George C. Williams in 1957 and more recently by Kristen Hawkes among others, it is more importantly and amusingly contrived to support Zelda's view of love as the "Stockholm Syndrome". . . "You want to know what love is. It's stress. It's just stress." Be assured there is no stress attached to your enjoyment of The How and the Why, only the when as in when you are going to see it. After thought: Math and Science have occasionally been the subjects for a play or a musical. There is one play in particular that used the science of physics as a launching pad to tell its provocative story and one musical that used a classical mathematical theory as the basis for its story. How bracing it was to listen to the German physicist Werner Heisenberg challenge his mentor Niels Bohr in Michael Frayn's Copenhagen back in 2000. There was a less known Off Broadway musical, Fermat's Last Tango, in which Princeton professor Andrew Wiles proves Pierre de Fermat's perplexing theory in 1990. He subsequently brought further fame to himself by fixing an error discovered by a colleague. Therefore we may look back someday and talk enthusiastically about a certain play in which two evolutionary biologists theorized at great length about why women stop menstruating. Editor's Note Curtainup has maintained a page of science plays reviews, with an alphabetical list of plays, with brief synopses and a link to the full review. The plays Simon mentioned are included and The How and the Why has now been added to that page. 91 University Place, Princeton, NJ. Tickets ($20.00 - $70.00) Performances: Tues, Wed, Thurs at 7:30 PM, Fri at 8 PM, Saturday at 3 PM and 8 PM, Sunday at 2 and 7:30 PM.